NEW YORK (WABC) -- Kenya's Stanley Biwott and Mary Keitany have swept the titles at the TCS New York City Marathon on Sunday as tens of thousands of runners competed in the 45th running of the marathon. 40-year-old American Meb Keflezighi, the 2009 champ, finished seventh. Keitany is the first woman to repeat since Paula Radcliffe in 2008. The 33-year-old Kenyan defended her title Sunday in an unofficial time of 2 hours, 24 minutes, 25 seconds, beating Ethiopia's Aselefech Mergia by 67 seconds. Keitany pulled away around the 21-mile mark to become the eighth woman to win more than once in New York. She had twice finished third in New York before breaking through last year when she won by just 3 seconds. That was her first marathon since 2012 because of the birth of her second child. Mergia is also coming back from a long break. Her daughter was born in July 2013 and she didn't run another marathon until winning in Dubai in January. Ethiopia's Tigist Tufa took third. Laura Thweatt of the U.S. was seventh in her marathon debut. 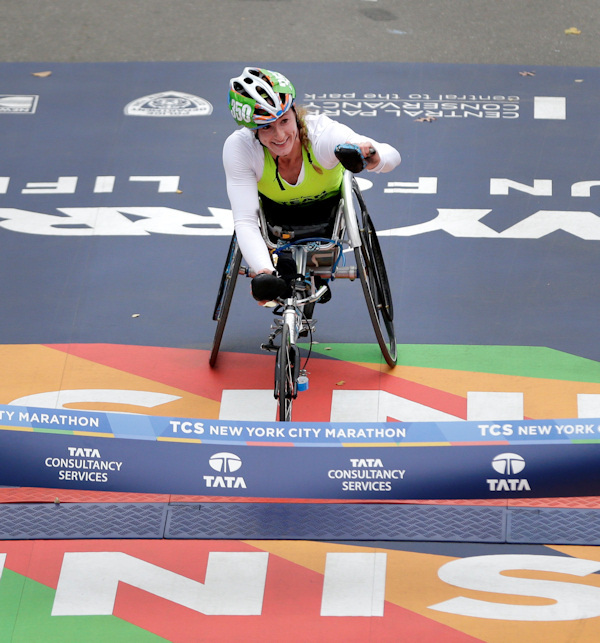 Tatyana McFadden has shattered the New York City Marathon women's wheelchair course record in sweeping four major marathons for the third straight year. The 26-year-old American finished Sunday in 1 hour, 43 minutes, 4 seconds. She again completed the Grand Slam of winning in London, Boston, Chicago and New York, extending her record streak. The previous record of 1:50:24 was set by Amanda McGrory in 2011. Tatyana McFadden, of the United States, crosses the finish line first in the women's wheelchair division at the 2015 New York City Marathon in New York, Sunday, Nov. 1, 2015. Ernst Van Dyk of South Africa won his second NYC Marathon title and first since 2005 in the men's race after finishing runner-up the last two years. He beat American Josh George by a second. Defending champion Kurt Fearnley of Australia fell out of his chair early in the race and came in fifth.